Every person is special and each of us wants to feel good about ourselves, but to me it is just as important to make others feel the same way. 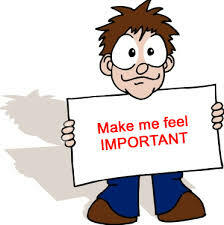 Whenever I meet someone, I try to imagine them wearing an invisible sign that says: MAKE ME FEEL IMPORTANT! I respond to this sign immediately and it works wonders. I think it’s a matter of showing people that you’re sincerely interested in them. Everybody likes to talk about themselves and I try to open my customers up. I remember asking one guy what his business was and he replied: “I work in a screw machine shop”. “No kidding, what do you do all day?” “I make screws”. “Really, I can’t picture how they make screws. You know, I’d like to come down to your place one day and see how you do it, would that be ok?” See what I was doing? I was showing him that I cared about him. Probably nobody ever asked him what he does with so much interest. During my slow time, I’d make it a point to go to his shop and visit him. You can’t believe how happy he’d be to see me. He would introduce me to his fellow workers and proudly say, “This is the guy I bought my car from”. I gave everyone my business card, and I picked up a lot of extra business this way. And as a bonus, I got to see a lot of fascinating things that helped me relate to my customers. From the moment a customer of mine walks into the dealership, I don’t care if I haven’t seen him for five years, I make him feel as if I saw him yesterday, and I really missed him. It should go without saying that you must come across with sincerity and that your sincerity be honest. Don’t ever think about lying because once you lie, you’ve lost all credibility. Your customer’s time is valuable and he’s not interested in phony compliments. It’s simply a matter of caring about your customer and wanting them to feel important. I want my customers to leave with the same feeling that people get when they walk out of a great restaurant. You know that satisfied, contented feeling. I remember a middle-aged woman who once came into the showroom saying that she wanted to kill some time and look at some cars. She said that her heart was set on buying a Ford, but the salesman down the street told her to come back in an hour. She told me that her mind was made up and she wanted a white Ford coupe, one just like her sister-in law’s. The woman said, “It’s a present to myself in honor of my birthday, I’m fifty-five years old today”. “Happy birthday” I said and I excused myself saying I’d be back in a minute. When I came back I said, “As long as you have some time on your hands, let me show you one of our coupes—it too comes in white”. About fifteen minutes later, one of the office girls walked in and handed me a dozen roses. “These aren’t for me,” I said. With that I gave them to the woman. “And many happy returns of the day,” I said. She was so touched, her eyes began to water. “I haven’t had anyone give me flowers in ages,” she said. As we talked, she told me about the Ford she wanted. “But the salesman wasn’t very nice. I suppose he saw me drive up in my old car and assumed I couldn’t afford to buy a new model. I’m sure you’ve guessed that she didn’t buy a Ford. She bought a Chevy from me and wrote a check for the entire amount. This story tells you something, doesn’t it? When you make a customer feel important, he or she is even willing to buy his or her second choice.